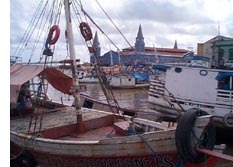 Belém is a major port city located at the southern bank of the Amazon River. The rich natural resources of the Amazon River have helped the city maintaining its strong economy and constant growth. In the last decade, Belém has expanded considerably, with its population approaching the one million mark. Visitors to the city are delighted with the mix of colonial and modern architecture, including the stately Victorian mansions built by the city's wealthy rubber barons at the turn of the century. Belém also offers the renowned Goeldi Museum, cultural events, superb restaurants and a chance for visitors to purchase some of Brazil's finest handcrafted pottery.